Rookie Drive is the result of the motivation and enthusiasm for exploring and learning about the MSX architecture and programming. This personal project begins in the mind of the user xavirompe who felt the call of his old MSX Sony HB-20P many years later, resulting in a new MSX hardware device. 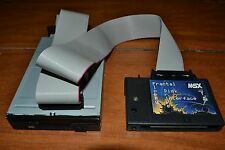 This interface consists of an USB virtual drive for the MSX computers that lets us to connect pendrives or hard disks. It is based on the file manage and control chip CH376S which supports FAT12, FAT16 and FAT32 file systems. At present the cartridge is able to manage .DSK files up to 720KB and with the embeded driver (CALL commands) we can open and list files as well as swap, make, format disk images and boot with the last image mounted. xavirompe expects to improve its features, if possible, so any help or suggestion are very welcome. Yes, this will be a must have for me! Really interesting! Is it compareable to this? Rookie drive is based on same CH376 chip, but for now Rookie drive is only oriented to the use of .DSK disk images. I think the info of Albiero is true, the CH376 can handle other kinds of USB devices, not only mass storage ones, but maybe a headache, because the CH376 only implements at high level mass storage devices. Now I am working hard to get a good finished version of the driver, the goal is to get an affordable and easy to use device. Some way to change directories. So we can have DSKs into folders like \MSX1\ , \MSX2\, etc. Some API to address those commands directly in ASM. maybe access to ISO files? Or any other large storage format, to mimick HD or CD-ROM? What about a Nextor driver ? Must say I really like the simplicity of the PCB here. Nice! Finally an USB interface for the MSX! Tip1: Since you're beginning to develop MSX hardware, it's very advisable always look at this article and check if your design is following these guidelines. Tip2: I/O ports are not a great idea for external devices on the MSX architecture. You should prefer memory-mapped I/O for its many advantages. What benefits will it have compared to SofaRunIt or HDemu or DSK emulation with Nextor? Very cool! Will be interested when it is something ready for production. Hi great suggestions, but for now Rookie drive uses MSX-DOS 1.1 and 16Kb Rom, and the Rom space is over with the current set of functionality. I like very much the suggestion about an API, very nice. Its a goal to reach, of course! It's a good sugestion, I take note of all of them, for now the limits of the design, and knowledge, can't be done in the first version. I am thinking about it, these days I am working hard to show it next saturnday on RU #50 in Barcelona, after the meeting i would upload some demo videos to the net. Next i will plan a version for sale, the current version its only for prototype and there are mistakes to correct. When the next version come available for production I will show it and set the price. Good to know, I need to aply some of the suggestions. I need to learn about this question, some extra info about? Not saying that it would be easy : this approach probably can't be just a Nextor driver, but a rewrite or different version of Nextor. Maybe the MSXDOS2.SYS and COMMAND2.COM will need also need some rewrite. What is a nextor drive? Can it swap disks during the game? Nextor is an MSX-DOS 2 compatible operating system, with many improvements, made by Nestor Soriano (see here). You can write your own "low-level" drivers for new hardwares. It's great ! One of the best buys of the past year. Great device, thanks xavirompe!